which doesn't compile in scmdraft since the correct keywords for the invincibility trigger are "enabled" and "disabled," not "set" and "clear". Edit: I was messing with this some more, and found that if you go into the Actions.php file and comment out the line GetMintStateConversion($state); in the set invincibility trigger, it compiles to "enabled" instead of "set". Post has been edited 1 time(s), last time on Dec 30 2015, 4:34 pm by Zoan. That's a bug. Looks like the line should be moved down one to be under 'if Minted'. So, how do I make it so it has a larger binary cutoff thing? I mean it should go up to 256, not just stop at 1 in the middle, right? Edit: So I changed the $Speed1 = new Deathcounter(P8, 500); to just $Speed1 = new Deathcounter(); and it works now, though the binary cutoff thing goes up to 1073741824, or 2^30. Is there a way to get rid of this redundancy? Post has been edited 2 time(s), last time on Dec 31 2015, 8:06 pm by Zoan. 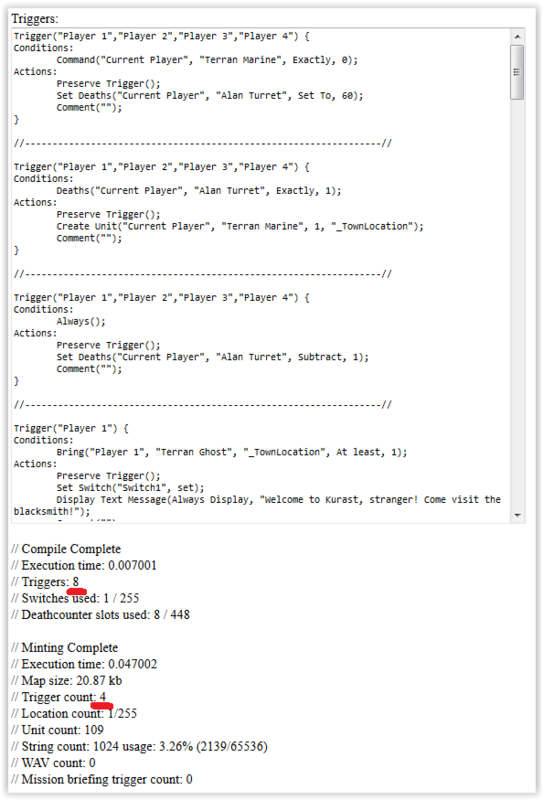 Killing a TempDC returns an action setting it to 0, so you should put the kill in a trigger to always properly clear it for reuse. Just done more efficiently. Does replacing the become with those two actions work properly? I can't think of a non-fringe case where TempDC needs to have a player specified for it. Unless you're utilizing "Current Player" you probably don't need to specify a player on Speed1 either. Have you tried just doing $Speed1 = new Deathcounter(500)? Unfortunately I don't have the ability to run Oreo with this computer to test anything myself. Post has been edited 1 time(s), last time on Jan 1 2016, 12:27 am by Kaias. Huh, yea I tried $Speed1 = new Deathcounter(500) and it worked then. (I didn't do this originally because I thought you needed to put a dummy player in the first slot in order to input the number - my bad). Weird. Well, I won't question it - Thanks! 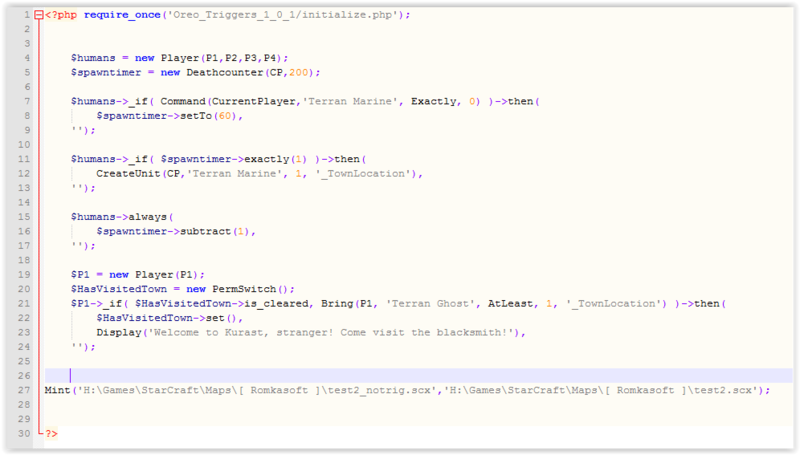 Also thanks for the tip on the kill function - I wasn't sure if that was just a thing for php or for the map itself. I hope this project is still living and active! It's great work! I configured Oreo and Mint as instructed, it generates triggers as expected; Mint creates the map file, but all it inserts are four hyper triggers. Why is that? Oreo doesn't seem to generate logs. Maybe there is a mode to turn it on? edit: I also noticed that the automatically generated hyper triggers do not have conditions at all. Not even a 'conditions:' section in the trigger syntax in the generated browser output - and consequently there are also no conditions in the hyper triggers of the map file generated by Mint. Is this intended? Apart from this, can you turn off the automatic generation of hyper triggers in Oreo? Or even configure what type of hyper triggers to generate? Post has been edited 1 time(s), last time on Aug 11 2017, 10:15 am by BumpelSnake. I always have the Mint line at the top of my code, I'm not sure if that makes a difference, probably not, but I'd try it. as for hyper triggers, you cannot turn them off aside from editing the Oreo code. I'm not sure why you would want to turn them off anyways. If a trigger has 0 conditions, its the same as having always() as a condition.